Turkey's strategic location as a gateway from Asia into Europe, and its proximity to opium producing areas of Afghanistan and Pakistan, have long made it an important locus for narcotics trafficking, predominantly heroin. Turkey itself has long been an opium producer. In the early 1970's, international pressure—mainly from the Nixon administration in the United States—obliged Turkey to enforce stricter rules for opium production in 1974, strictly limiting it to amounts required for pharmaceutical purposes. Up until then heroin was produced in Turkey as an opium derivative and quantities were sold to the West with the assistance of the Sicilian and Corsican mafias. The heroin to be sold was transported by ship to Sicily, and then to Marseilles, where the Corsicans had created labs for the production of commercial product. From there it was transferred to New York and other American ports where the Italian-American mafia would organize its distribution. The United States administration at that time declared a war against narcotics and obliged the Turks to seek other sources of opium. Soon enough Turkish operational production bases were established in Afghanistan and northern Pakistan. The conflict in Afghanistan during the 1980's, as well as the resurgence of a Kurdish insurgency in southeast Turkey after 1984 and the Iraq-Iran war of the same period; created a convergence of political, criminal, and military operations along the heroin supply chain from Afghanistan to Turkey. Moreover, the effective destruction of Beirut in the 1980's reduced that city's suitability as a prime port for the narcotics trade and this role was then taken on by Istanbul. Thus, the situation after the end of the Cold War in 1989 found Turkish organized crime groups involved in heroin trafficking much stronger financially from their trade in the previous decades and ready to pursue stronger ties with the supplier countries of Central Asia. Furthermore, the rise of Albanian organized crime and militant groups in the 1990's, and the civil wars in former Yugoslavia, provided ample human resources in the Balkans eager to get involved in the drug trade so as to survive financially or gain capital to achieve their political aims. Europe now already hosted considerable Turkish minorities—especially Germany—and some individuals from those Turkish communities were used to act as local retail agents for heroin distribution in Europe. Turkish organized crime groups retain tight control over heroin trafficking into Europe. Hungary, Romania, and Bulgaria are utilized by Turkish organized crime for heroin warehousing. Synthetic drugs are increasingly being shipped back along the Balkan route from the Netherlands to markets in Turkey. Turkish organized crime groups function primarily as coordinators, financiers, and facilitators in the drug trade. Their experience in areas such as transportation, company formation, and facilitation management is used for organized crime activities in illegal immigration and trafficking in human beings. Turkey is an important transit country for illegal immigration to the European Union from, for example, China. Turkish organized crime groups are known to be involved in an array of legal businesses that are likely to be a method of laundering proceeds from heroin trafficking. Restaurants, bars, fast-food franchises, real estate agencies, travel agencies, and vehicle repair shops are examples of such businesses. A large number of heroin shipments enter Turkey each month. 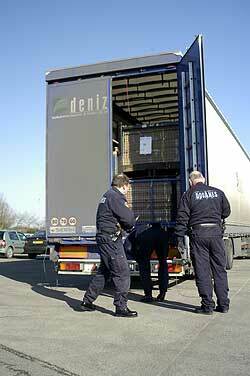 They are then delivered, mainly through the Balkan route, to destination countries throughout Europe. In 2004, Turkish law enforcement agencies seized more than 6.5 tons of heroin and 4.5 tons of morphine base, in addition to over 100,000 liters of acetic anhydride, the principle chemical for heroin synthesis. Historically, the Balkan route is the main overland connection between Asia and Europe. Every year, this route is taken by around 1.5 million trucks, 250,000 coaches, and 4 million cars .The most common way to transport heroin is to hide a relatively small quantity of 20 to 50 kilograms in a truck. Considering the scale of legitimate commercial trade on the Balkan route, combined with the fact that it takes many hours to a whole day to search a truck, explains why it is virtually impossible to counteract these activities. In 1998, Tim Boekhout van Solinge estimated that 75 percent of the heroin smuggled into Europe is transported along the Balkan route. Germany is a central redistribution point within Europe. Once heroin reaches Germany, it is repackaged and shipped on from there to the other major European markets, especially Britain and Scandinavia. Moreover, some of the leaders of the Turkish syndicates resided in Germany in the 1990's and the country became a center of gravity for Turkish organized crime, at least with regard to their European narcotics trafficking operations. Turkish organized crime groups are usually hierarchical and homogeneous, but over the years they have formed some enduring partnerships with other organized crime groups in Europe. Many Turks involved in the drug trade the Europe are long-term residents within their host countries, which assists them in developing links with non-Turkish organized crime groups and in their move to other areas of crime. In this respect, collaboration between Turkish and Albanian groups in particular has proved beneficial in exploiting large segments of the European market, in many different fields of illegal business. The alliance of Turkish and Albanian criminal groups is due in part to historical cultural, religious, and ethnic links, and to an Albanian tendency to join and serve larger ethnic groups with whom they feel some affinity. A similar relationship developed in the United States, and in particular in New York, where for decades Albanian crime groups tended to operate under the aegis and influence of the much stronger Sicilian-American mafia families. Albanian "procurement groups" mainly purchase heroin from Turkish wholesale traders who are increasingly using Hungary, Bulgaria, and Romania to cache heroin that has passed down the supply chain. Over the past few years, trends have emerged concerning Turkish organized crime that suggest a diversification process is taking place. For instance, there is a firearm trafficking route to Western Europe that runs from Turkey through Serbia and Montenegro. Turkish small arms are increasingly finding their way through the black market into Western Europe via the Balkan route, the same route used to transport heroin and other narcotics. Furthermore, it seems that certain groups of Turkish origin residing permanently in Western Europe, and most importantly in the Netherlands, are increasingly involved in the distribution of synthetic drugs from that country into Germany and Turkey. In exchange, they are supplied with heroin or weapons. In essence, they are diversifying their criminal activities by engaging in the trafficking of both drugs and arms. Turkish groups retain a tight control over the exploitation of the heroin market in Europe and in Britain in particular. According to the British National Criminal Intelligence Service (now replaced by the Serious Organized Crime Agency) spokesperson in 2006, "Turkish organized crime retains a tight control over the estimated 30 tons a year that feed into the U.K. On average, the authorities seize only two tons per year. The profits are made not by Afghan traffickers or the Taliban but by trafficking organizations in Turkey [and] U.K.-based, Turkish organized crime groups." The diversification of Turkish operations also has a geographical element, since over the past few years there has been an increased focus on setting up businesses in Hungary to facilitate drug shipments. Hungary is a new member of the European Union, located right in the center of Europe and close to the main markets of Germany, Italy, and Poland. Moreover, it has less well-developed organized crime monitoring and prevention structures than some of its neighbors, and has become something of a base for Turkish, Albanian, and Chinese groups. It is interesting to note that document forgery is another area of criminal activity that, according to Europol, is growing as an illegitimate source of income for Turkish organized crime. The presence of Turkish organized crime groups in the Netherlands has intensified in the past few years. Police authorities in Amsterdam have reported significantly increased activity by crime groups from the Balkans and Turkey. These groups specialize in smuggling immigrants, narcotics, and arms. Showing some specialization (Turkish groups have focused on narcotics, Slavic groups on arms) the groups have fought over markets and territories in the city. Police raids have found grenade launchers, explosives, and "heavy weapons suitable for warfare," believed to be in transit from origins in Eastern Europe to terrorist groups. As mentioned above, Turkish organized crime has gradually become involved in the distribution of synthetic drugs. As a consequence, the trafficking of drugs such as ecstasy into Turkey has increased. Turkey was in a very good position regarding drug use rates before ecstasy availability increased, and statistics point to a sharp rise in the use of synthetic drugs among young Turks. Social and economic changes, drug prices, and tourism are blamed for a trend that has also altered traditional smuggling patterns in the mainly Muslim country. It is important to note that the dumping of synthetic drugs (at very low street prices) was made possible by the European-Turkish organized crime syndicates that are now finding their homeland to be a lucrative market. The increase in the activities of Turkish organized crime, over the past few years, can be illuminated by a review of money laundering activities that have expanded in the country. While the number of suspicious transaction reports submitted by Turkish financial institutions has "increased substantially," the level of reporting "remains low" when the "size and nature" of Turkey's financial sector is considered. That was one of the key findings of the Financial Action Task Force's "Third Mutual Evaluation Report" on Turkey, which rated the country's efforts to interdict money laundering and terrorist financing. The major sources of criminal proceeds in Turkey are drug trafficking, smuggling, fraud, bankruptcy, document forgery, pillage, highway robbery, kidnapping, and "serious crimes against the state," according to the task force's report. The primary tools for laundering are money transfers and other banking transactions, commercial transactions, accounting transactions, and real estate transactions, the report added. Moreover, the annual Organization for Economic Cooperation and Development financial report for 2007 revealed the existence of the problem relating to money laundering from organized crime activities. According to the report, "The number of convictions for money laundering in Turkey is relatively low, and the new legislation has not yet been in place long enough to fully demonstrate its effectiveness. Confiscation measures, although complete, have also not yet produced substantial results. The Turkish FIU [Financial Intelligence Unit] is responsible for the receipt, analysis, and dissemination of STR [suspicious transaction report] information for investigation by law enforcement. The number of STRs received, however, is relatively low." A closer examination reveals an abundance of undeclared capital flowing into the country over the past five years that has its social and political ramifications as well. Between 2002 and 2003, the summary balance of payments for the net error and omission category—basically unexplained income—increased from $149 million to almost $4 billion. It is believed that Turkish-based traffickers transfer money to pay narcotics suppliers in Pakistan and Afghanistan through alternative remittance systems. The funds are transferred to accounts in the United Arab Emirates, Pakistan, and other Middle Eastern countries. The money is then paid to the Pakistani and Afghan traffickers. The Turkish judicial system lacks sufficient training to combat organized crime by pursuing an anti-money laundering policy. Between 2003 and 2005, more than 2,100 money-laundering investigations were launched, but only eight resulted in convictions. One factor contributing to this low conviction rate is the fact that Turkey's police, prosecutors, judges, and investigators need additional training in dealing with financial crimes. In addition, there is a lack of coordination among law enforcement agencies, and between the courts that prosecute the predicate offences and those that prosecute money-laundering cases. Most of the cases involve non-narcotics criminal actions or tax evasion; but a considerable 30 percent are narcotics-related. In July 2007, Pakistan's security agencies alerted its European counterparts to a massive human trafficking operation that it had detected. According to this information, organized crime groups were about to transfer 10,000 illegal immigrants from Pakistan to Europe via Turkey, and they were due to arrive—most probably in the Greek Aegean Sea—by early September. Greek security sources confirmed the report, and an operation was allegedly carried out by the Turkish police to locate the immigrants along with the criminal network responsible for their transfer. It has to be noted though that September witnessed a substantial increase of illegal immigration along Greek and Turkish border regions resulting in a special meeting between Greek political officials just a few weeks ago. Turkish crime syndicates have exploited the strategic geopolitical placement of the country, as an Asian gateway to Europe, in order to expand their operations in illegal immigration and human trafficking. This is a truly global criminal enterprise and the profits are immense. According to the Foreign and Commonwealth Office in Britain, "Globally each year 500,000-700,000 people are trafficked, earning criminals $12-20 billion," and that might be a very conservative estimation. Most groups that facilitate immigration crime prefer to work within their own ethnic and family backgrounds, and are mainly of British-South Asian, Chinese, Turkish, or Albanian ethnic origin. Criminals charge from 2,000 to 20,000 pounds to bring someone into Britain. Typically, repayment for the journey or for provided accommodations can involve long-term menial, low-paid labor, and in the case of women, forced prostitution. In 2004, it was noted that over one million illegal immigrants were "in transit" through Turkey. It was assumed a third of them would exit the country and head toward European cities. Besides being a "transit country," Turkey has gradually become a "target country" with more and more illegal immigrants entering Turkey by sea, air, and land from Asian and African countries. Facing increasing human trafficking, Turkey introduced an action plan and launched a national task force in 2003 to cope with the issue. According to Turkish Police Director General Gokhan Aydiner, more than 500,000 illegal immigrants have been captured in the country over the past 10 years. In an interview with local private television station NTV, Aydiner said, "The transportation of 575,516 illegal immigrants via Turkey has been hindered and 6,113 human traffickers from 39 different countries have been captured since 1995." An agreement between Azerbaijan, Georgia, and Turkey on combating terrorism, organized crime, and other perilous types of crime (April 30, 2002). A Greek-Turkish protocol on combating organized crime (June 21, 2002). An agreement between Ukrainian and Turkish organs for fighting organized crime to broaden cooperation (March 5, 2003). An agreement between the United Nations and Turkey to increase cooperation against drug trafficking and organized crime (Sept. 3, 2003). A ministerial meeting between Greece, Iran, Pakistan, and Turkey on organized crime (Dec. 17, 2005). The general outlook for Turkish organized crime groups is a continuation of their strong role in the contemporary European environment as well as in Turkey. The heroin trade is mainly in the hands of second generation Turks residing in Germany who collaborate strongly with their Albanian counterparts in a variety of schemes. Interesting trends in the operation of these groups include their diversification into the synthetic narcotics market, with the Netherlands as an epicenter. Moreover, Hungary is becoming a regional hub for Turkish groups, as it has been for a number of other crime syndicates since the early 1990's. Illegal immigration is a lucrative trade originating from the transfer of Asians to Europe via Turkey, a multibillion-dollar illegal commerce that further empowers Turkish criminal groups. Money laundering poses a considerable threat for Turkey, and recent international reports indicate a substantial increase in the flow of informal capital into the country. This correlates with increasing organized crime activities originating from Turkish citizens over the past few years. The Turkish authorities have progressed in forging regional agreements to combat the activities of organized crime groups, and have increased their effectiveness in confiscating narcotics shipments, resulting in numerous arrests. What is important to highlight though is the transnational aspect of the Turkish groups that calls for a coordinated pan-European response. Finally, a weakness on the part of the Turkish authorities with regard to combating organized crime is the lack of the appropriate skills in dealing with capital laundering and the transfer of illegal funds that fuel support for organized crime groups and allow them to become more influential domestically and internationally.